We have new sets of documents every day which should be printed by the next day, and we wish FolderMill could do it after most employees have left the office. Is there a way to automatically start and stop FolderMill at a certain time? For example, start FolderMill at the end of the working day and cease file processing in the morning, right before the work hours. 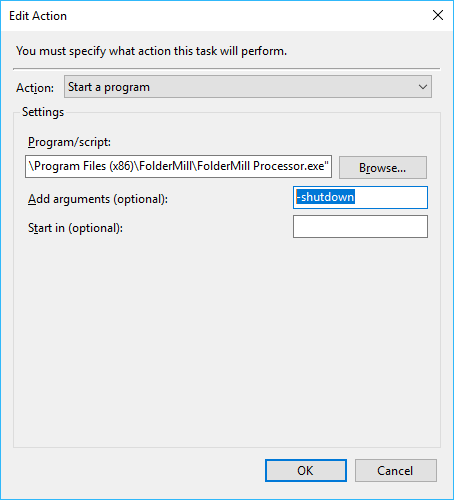 FolderMill can be forced to start and stop its work whenever you want. 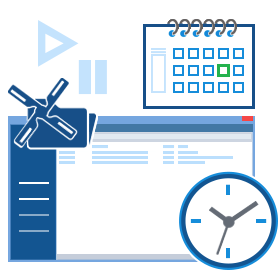 Just schedule its operation using built-in Windows Task Scheduler to plan the time for conversion or printing of documents with our step-by-step guide. Alternatively, you can easily configure Task Scheduler to copy new files from a defined local folder to a Hot Folder. In this case, FolderMill real-time processing keeps running. Set a time-based or event-based trigger. You can specify the exact time and make the task recurrent by defining time intervals: daily, weekly, monthly or even certain days of the week. Event-based triggers allow you to start FolderMill at a specific event, e.g. at user log on. You can add multiple triggers, if necessary. Let's set the time trigger to Daily, 18:00 and click "OK". Now FolderMill service is configured so that it starts real-time processing of files at 6 PM and stops working at 9 AM every day. You can test in advance whether everything is set correctly. Open FolderMill Control Panel (FolderMill processing should be stopped). 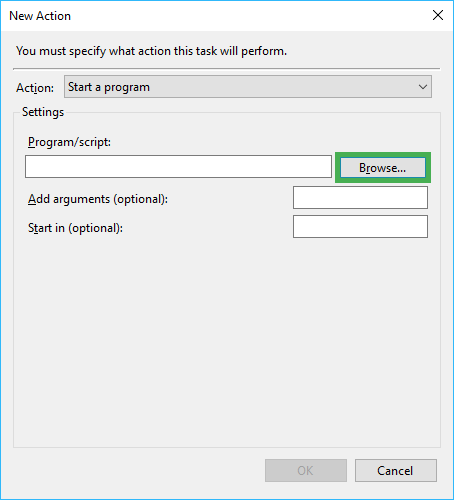 Switch to Task Scheduler, select the sc start FolderMillService Action and click "Run" on the right menu to make a test run. You will see the task running: FolderMill's windmill will start rotating, and the status will change to "FolderMill is running" on the program's Control Panel. You can also open the FolderMill Control Panel right before the scheduled trigger should work, and check the windmill rotation. FolderMill can also work as a regular desktop application (FolderMill Processor). 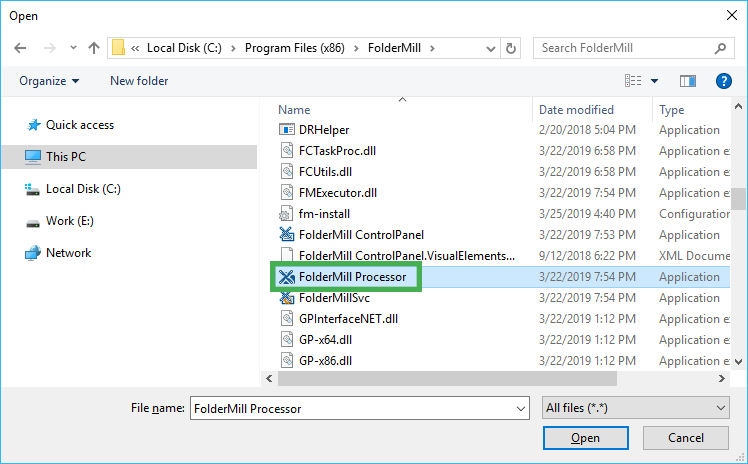 Take the same steps as described above, but select FolderMill Processor to run. If you have files accumulated in a certain folder during the day, there's another way to set the right timing for their processing. You can just set Windows Task Scheduler to copy the needed files to a Hot Folder on schedule. This can make things much more flexible this way since FolderMill keeps running without interruption. cmd /c move /y "C:\Input\*" "C:\FolderMill Data\Hot Folders\1\Incoming\"
This command will move all files appearing in C:\Input to the Incoming folder. Just set it to launch at the right time – using a time-based or event-based trigger (as described above). 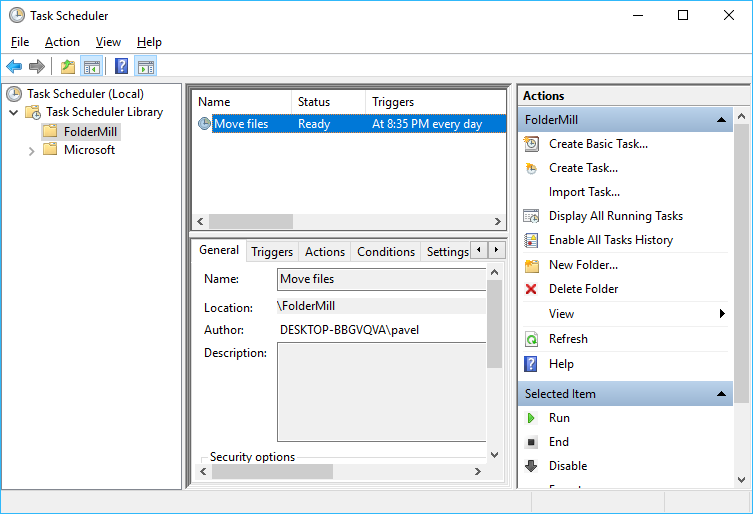 FolderMill combined with Windows Task Scheduler gives you many options to set up timing for your files processing. If something doesn't work for you, please contact us, and we will find a solution for you.